"I'm so sorry," the soothing voice continued. "I didn't mean to startle you. We're going to be landing in a few minutes, and I need you to put your tray table up." "Oh." Bex looked at her hands, her knuckles white as she gripped the tray table in front of her, then back to the flight attendant. She felt the familiar heat of embarrassment singe across her cheeks. "Sure. I'm sorry." The flight attendant straightened. "Thank you." Her smile was as bright as a Crest commercial and her hair swirled behind her as she continued up the aisle, reminding the other passengers that they were landing soon. Bex's heart didn't stop its relentless thump. "Excuse me," she said, leaning forward in her seat. The flight attendant turned. "Mmm-hmm?" "Do I have time to use the restroom?" Bex stared out the car's passenger-side window as the scenery zoomed by. She had never been to Kill Devil Hills, though she had seen postcards and TV shows set here, but what was whizzing by her—nondescript strip malls, Target shopping centers, and fast-food places—made her feel like the puddle-jumper flight from Raleigh, North Carolina, had landed her right back there. If it hadn't been for the woman in the driver's seat who was chatting happily about something Bex couldn't focus on, she would have wondered if this whole moving-across-the-state thing was just a big hoax. "Does that sound good to you?" Bex felt her mouth drop open. "I'm sorry, what?" Denise tucked a strand of deep-brown hair behind her ear. "I'm sorry, Bex. That's such a cool name, by the way. I'm probably just talking your ear off. We're just really happy to have you here. I know it can't be easy for you…"
The familiar lump started to form in the back of her throat and Bex shifted in the car seat, working the seat belt strap between her fingers. Her grandmother's face flashed in her mind, and the familiar smells of the house where Bex had lived since she was seven years old filled her nostrils—her grandmother's powdery, lavender smell; the sweet, cloying scent of night jasmine when it wafted through her bedroom curtains; the earthy smell of hot grass as she tromped barefoot through it. But that was a world away in another life. Her grandmother had passed seven months ago and Bex's home had been sold. She'd been shifted into a "temporary care situation," which basically meant she was stuck in a cross between an orphanage and juvenile hall until a foster home willing to take her opened up. They didn't know the truth. They didn't know that Bex's own mother had disappeared when Bex was only five years old and still called Beth Anne Reimer. They didn't know that Beth Anne was doted on by a father who lavished her with costume jewelry and funky purses. They didn't know that all the gifts Beth Anne's father gave her had once belonged to women in the Research Triangle area of North Carolina. Women who Beth Anne's father—dubbed the Wife Collector in the press—had murdered. Allegedly. The word gnawed at Bex's periphery. It was Beth Anne herself, a shy, moon-eyed seven-year-old, who had pointed a chubby finger at her own father when the police came to her house. Yes, she knew the pretty blond woman from the photograph, she had said to the police officer. The girl had been with them for two days before getting into the car with Beth Anne's daddy. No, she didn't know where they had gone. All she knew was that the blond lady never came back to the house, never came back for the nubby scarf she had wound around Beth Anne's neck, so Beth Anne had kept it for herself. It was just a few days later that Beth Anne's daddy was locked in that police cruiser and shuttled down to the courthouse. The newspapers and local news station splashed headlines everywhere and that single word—allegedly—seemed to grow smaller, to fade into the enormous text around it. Hannah Schwartz lives in the San Francisco Bay Area and writes cozy mysteries, young adult fiction, chick lit, and grocery lists that she never seems to remember to bring to the grocery store. Hannah shares a house with two neurotic, feet-attacking cats and has a Kryptonite-like weakness for donuts. 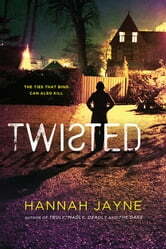 Enter for a chance to win 1 of 5 copies of Twisted by Hannah Jayne via Sourcebooks. This giveaway ends on July 18th. Winners will be notified by Sourcebooks.